In this section we will learn how to install Linux operating system on an unformatted DOC and boot from it using LILO as the boot loader. In order to get to this state, a procedure will be discussed. Some steps in this procedure resemble the steps discussed previously in this document. Even so, this should be considered a separate procedure, rather than a continuation of the steps in Section 4. This section will basically try to fulfill the above three requirements. The following steps should be followed for achieving the goal of this section. We will use the dformat utility from linux_binary.5_1_4/dformat_5_1_4_37. D000 specifies the address of the DiskOnChip in the BIOS. The following is the BIOS (RTD Enhanced Phoenix - AwardBIOS CMOS Setup Utility (v6.00.04.1601)) setting on our system. The Bios Ext. Window denotes the address for your DiskOnChip. The setting may be different depending upon your BIOS version. Now shutdown the system and boot into Windows XP. From now on you will notice the TrueFFS message and some time delay before the Grub Menu appears. Boot into Windows XP. We will use the M-Systems Dos Utilities for formatting the DiskOnChip. The Dos utility dformat will copy the firmware to the DOC, and then format it as a fat16 device. Check the DOC partition using another utility called dinfo. A sample dinfo output is given in the appendix. Again shutdown the system and now boot into Linux. After formatting you should always do a full shutdown (power off) and not just a reboot. Even though Step 1 and Step 2 seem to be the same, the only difference being that Step 1 is done from Linux and Step 2 from Windows XP, they both have to be done. This has to be performed in exactly the same manner as described in Section 4.1 and Section 4.2. Also add an entry for the new kernel in /boot/grub/menu.lst as described in Section 4.4. This is done using the ame procedure as described in Section 4.3. This is required since our nodes use a major number of 62, while the doc driver module uses a major number of 100. When creating the initrd image, the driver will be loaded with major number value of 100 (instead of 62) if you do not edit the module configuration file. This will make it impossible for the nodes to use the driver. The reason for using the initrd image will be explained in the next step. The mkinitrd_doc script from linux_binary.5_1_4/doc-linux-5_1_4_20/driver reads the /etc/modules.conf file and looks for anything that has been mentioned for the DOC driver regarding the major number. By default, mkinitrd_doc will create an initrd image that loads the DOC module with a major number of 100. However, with the modifications we have made to the /etc/modules.conf file, the initrd image will load the module with a major number of 62. Check for the newly created initrd image, initrd-2.4.18.img, in the /boot directory. Running the mkinitrd_doc script produces this image. The reason for making an initrd image is that the provided M-Systems driver cannot be added as a built-in support in the kernel, which leaves no other option than adding it as a loadable module. 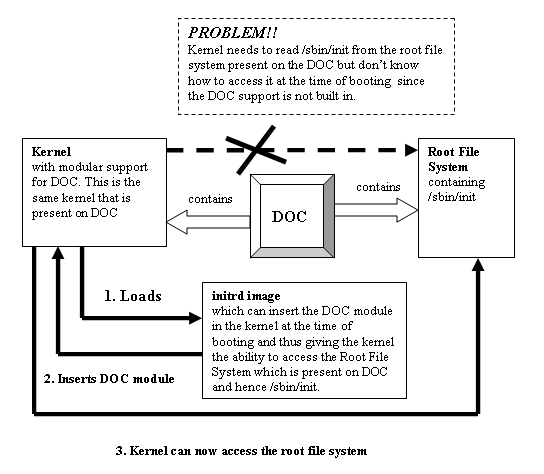 If we want to boot from DOC, the kernel should know how to access the DOC at the time of booting to search for /sbin/init in the root filesystem on the DOC (the root filesystem is necessary to get the Linux system up). Reboot the system and boot into the newly created kernel. To access the DOC, ensure that the major number assigned to the nodes is 62. In case of a major number of 100 is assigned, check if the /etc/modules.conf was successfully modified. If it was not, then repeat Section 5.5. You must then also repeat Section 5.6 because the initrd image depends on /etc/modules.conf. If the DOC entry were incorrect in this file, the initrd image will be useless. Perform Section 4.6. This is required to create partitions on the DOC. Before starting with this step make sure that you have not mounted /dev/msys/fla1 on any of the mount points, as this step will involve reformatting the DiskOnChip. Also, in order to understand the details of Root File system refer to The Linux Bootdisk How To available at http://www.tldp.org. We will use the mkdocimg script located in linux_binary.5_1_4/doc-linux-5_1_4_20/build. We will also use the redhat-7.1.files directory, located in the same directory (i.e. build), which contains the list of the files that will be copied in the root filesystem that will be created on the DOC. This step will take a few minutes to complete. The most important is the boot directory. This contains the vmlinuz-2.4.18 and initrd-2.4.18.img which gets copied from the /boot directory. This directory is required when booting from DiskOnChip. These two files are created later by LILO. The redhat-7.1.files directory contains a list of files and directories that will be created when we use the mkdocimg script. This script does not create all the files that are necessary for creating the root filesystem on the DOC. So replace the directories created by the mkdocimg script, with the directories of the / filesystem (root filesystem that is currently running). The directories under /, such as etc, sbin, bin and so on contain lot of files that are not useful and ideally should not be copied while building the root filesystem for DOC. But since we have not discussed the files that are essential and the files that can be removed, we therefore suggest that one should copy the entire contents of the directories. We know that it is a clumsy way of building the root filesystem and will unnecessarily take lot of memory; bear with us as in the next section we will explain how to put the development tools on the DOC. We will then remove the useless files from the root filesystem of DOC. If you are aware of how to build the root filesystem we would encourage you to copy only the essential files. Now our filesystem is ready. The total size occupied by this filesystem will be about 35Mb. We are going to use LILO as the boot loader since this is the only BootLoader that can read an INFTL device without many changes to be done to the BootLoader source code. For more information on how LILO and other boot loaders operate, refer to . We need to compile the lilo-22-3.2 source code to get the executable file for LILO. We will use the source code from linux_binary.5_1_4/doc-linux-5_1_4_20/lilo/lilo-22.3.2. Create a soft link for the kernel-2.4.18 source code with the name linux. If the above steps are not done the build might fail. Where "+" indicates the lines to be added. Make sure that the gcc version is 2.95.3 by using gcc --version. We need to copy the file boot.b from linux_binary.5_1_4/doc-linux-5_1_4_20/lilo/ to /mnt/doc/boot. The file contains the essential stage1 and stage2 of the LILO boot loader. Copy the newly created /etc/lilo.conf to mnt/doc/etc/lilo.conf. This step will configure LILO in the MBR of the DiskOnChip and hence make the DiskOnChip bootable. Ensure that /dev/msys/fla1 (root filesystem partition for the DOC) is mounted on the mount point /mnt/doc. /mnt/doc denotes the location where the BootLoader will be installed, so it is installed on the DiskOnChip, as /mnt/doc is the mount point for the primary partition of DOC where LILO was configured. This will create a compressed copy of all the contents of DiskOnChip with the name docimg.tgz in /home. The NOFORMAT flag is important otherwise it will reformat the DiskOnChip device, and the contents will be lost. The above command will cause the DiskOnChip to boot in the absence of any other bootable device. So we need to remove the Hard Disk in order to allow the DOC to boot. Check your BIOS manual for enabling booting from a BIOS extension device i.e. DiskOnChip. On our system we had to disable the Hard Disk and CDROM and set the first bootable device as HDD-0. Reboot the system after making the necessary changes in the BIOS. You will get the LILO menu and on pressing enter Linux gets booted from DiskOnChip.